On July 1, 2001, Portugal “decriminalized” (not “legalized”) all drugs, including cocaine and heroin. 10 years later, the country, which had one of the worst drug problems in Europe, cut addiction rates in half by connecting drug users with communities instead of jailing them. Monday through Friday, 9 a.m. to 5 p.m. That’s the “full-time,”40-hour work week [although most are expected to work more than 40 hours every week] of salaried people across the world, which often leads to burnout, less individual efficiency and less creative stimulation. However, Danes only spend 37 hours per week on the job, yet they are the happiest people in the world. In this piece, Lucy Purdy investigated alternative working models that offer more enrichment than a 40-hour work week. A progressive activist group, established by the Occupy’s Strike Debt movement, launched the “Rolling Jubilee” campaign in 2012, to help people repay outstanding credit. The modus operandi was simple: buy personal debt from banks for a low price, abolish it, and free the individual from the debt. In 2013, Rolling Jubilee spent $400,000 to purchase $14,734,569.87 worth of personal debt; in 2014, another $3.8 million worth of student debt for about $100,000; by 2015, the group had raised more than $700,000 and abolished $31,982,455.76 worth of tuition and medical debt. When the film Pay It Forward was released more than ten years ago, the concept of the gift economy entered the mainstream; however, it is actually more ancient than the money economy. Mark Boyle, an Irish activist and writer best known for living without money since November 2008, explains how money separates us from what we consume and the impacts of our behavior, and how the gift economy could bring us closer to each other and to the effects of how we live. 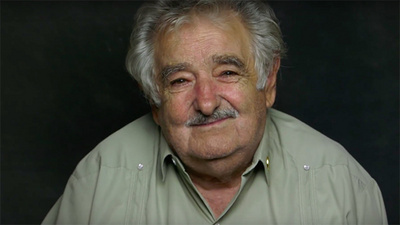 The “world’s most humble president,” José Mujica donated 90% of his salary to charity, lived in a tiny one-storey home on a farm on the outskirts of Montevideo, and drove a 1987 blue VW Beetle. He legalized marijuana, he legalized abortion, yet he ensured that Uruguay became a bastion of pragmatic economic policies under his realm. In December 2010, Bolivia became the first country in the world to pass the world’s first laws granting all nature equal rights to humans. To protect the well-being of its citizens by protecting the natural world, the Law of Mother Earth established 11 new rights for nature. These rights include: the right to life and to exist; the right to continue vital cycles and processes free from human alteration; the right to pure water and clean air; the right to balance; the right not to be polluted; and the right to not have cellular structure modified or genetically altered. MIT-trained molecular biologist, Jon Kabat-Zinn uses a combination of mindfulness meditation, body awareness, and yoga to treat the chronically ill, as well as a variety of conditions in both healthy and unhealthy people. His mindfulness-based cognitive therapy program also helps reduce stress, and improves the quality of life. Wake Up London has been successful in conducting flash mobs to show how people can sit down and experience inner silence in the centre of a huge city; how meditation can enable people to unite as a multicultural group of all ages and backgrounds; and how meditating together creates peace, within and without. Positive News editor Seán Dagan Wood caught up with the award-winning filmmaker, musician and creative catalyst Jamie Catto to discuss his series of innovative workshops aimed at inspiring people to realize their potential, by liberating them from the burden of hiding their fears, insecurities, and insanities.